Does that tummy grumble on a Tuesday when the clock hits 2:53p only send your mind off your work and dreaming of that vending machine on the next floor down? Think again people! Giving in even once a week for a candy bar or pastry loaded with chemicals, altered grains, food dyes, and refined sugars will set you back on your path to healing! Having healthy snacks will help to keep your blood-sugar level and your appetite in check. I recommend eating healthy, GOD snacks throughout the day to keep your metabolism balanced and to eliminate temptation for unhealthy treats. To stay on track, have easy go-to snacks with you throughout your day to keep you on track and your hunger at bay. 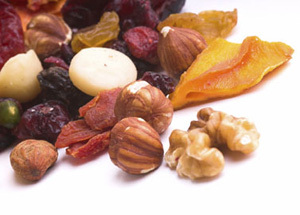 - Nuts and Seeds: Raw is the key here, as roasting damages the sensitive healthy oil in the nuts. Raw almonds, cashews, shelled sunflower and pumpkin seeds are protein-PACKED and very easy to store at your desk, in your purse or gym bag. Try adding raw coconut flakes, carob or cacao chips, dried blueberries and strawberries to make a simple HEALING trail mix. Skip the M&Ms, and Craisins as they’ve got a lot of sugar and probably a lot of chemical additives. And avoid the peanuts, too, unless they’re organic Valencia (the only peanuts without the naturally occurring toxic fungus called Aspergillus flavis which most people are allergic to). - Half an Avocado with Lime: Have you tried this yet?? A great source of energy when you need it! Fill up on good GOD fats! Mash up half an avocado with a squeeze of fresh lime juice and sprinkle of sea salt. You can do that in the morning and store in the office fridge til snack time. The lime juice will keep the avocado from turning brown! - Hard Boiled Eggs: Should be a staple in your office fridge, organic hard boiled eggs can nourish you thru a few hours until you can clock out. Boil a dozen on Sunday and take a couple with you every day thru the week. One egg holds 6g protein. And eat that yolk! Free-range eggs are rich in Omega 3 fatty acids! - 1 cup Full Fat Greek Yogurt: While raw yogurt is always the best, we often can’t find it easily in our grocery isles. Greek yogurt can be found at most grocery stores and is processed a little differently than the regular homogenized yogurt you find on the shelves. It’s thicker and richer than the regular stuff and seems almost like a dessert! Greek yogurt has about 50% more protein than regular yogurt, too. A cup of Greek yogurt is packed with 20 grams of protein. As long as you’re buying organic, get the full fat because it’s the least processed. Americans are deeply deprived of good Omega 3 fatty acids in our diet — we get them from healthy fats found in meat, eggs, fish and dairy! Opt for full-fat whenever possible — the rule applies only for raw or organic sources of dairy. - Protein Shake: Studies are showing Americans aren’t eating enough protein for their height and weight, and thus are losing lean muscle mass. This means our bodies eat away at our muscle when we don’t eat enough which also causes our cells to age prematurely. Make sure this doesn’t happen to you! Get yourself a good, grass-fed whey protein mix (we use The Organic Whey) and a Blender Bottle and keep them at your desk. You can mix the shake up with just water, or keep a quart or two of organic almond milk in the fridge to add creaminess! Throw in a scoop of greens (we use Dynamic Greens from Nutrition Dynamics) to add in your phytonutrients and antioxidants, and you’ve got a pretty well balanced snack ready to gulp down, very little sugar or carbs!! - These Fruits are A.O.K: Granny Smith apples (perhaps with all natural Valencia peanut butter? ), strawberries, blueberries, raspberries and blackberries. Enjoy these fruits throughout your day as long as they’re organic! If weight loss isn’t your concern, feel free to enjoy some melon, orange, peach, grapes, pineapple, mango or cherries every so often (o r g a n i c). Be careful with these and any other fruits as they are high in sugar (although it is natural sugar, better than the white stuff) and higher in carbs that will slow down fat burning. - PaleoBars or Nutiva Hempseed Bars: PaleoBars are made to fit into the Paleo Diet, which has some similar principles to the Maximized Living Nutrition Plans. They are great organic nutrition bars balanced in good fats, protein and carbs created to tide you over until your next meal. Nutiva bars are USDA organic hempseed bars, rich in Omega 3s and protein. SO GOOD! Dave and I enjoy both of these bars a few times each week, especially on the days we slacked and didn’t do the grocery shopping for fresh produce. They are great to throw in our lunch bag or purse and go! PaleoBars can be ordered from Designs for Health and Nutiva bars can be ordered from Nutiva. - Olives: Are you an olive lover?? If you are, indulge! We all know how good olive oil is for us. Olives in general are a very healing fruit. Olives are rich in iron, Vitamin E, fiber and copper, as well as rich in healthy omega-3s. Olives will aid in decreasing inflammation, dissolving away free radicals from the body and help to prevent an array of diseases (heart disease, arthritis, colon cancer, etc). When choosing olives for their health benefits, always opt for those that have been traditionally cured (as opposed to lye-processed). Keep a container of them at the office whenever you have that salty, flavorful olive craving! - Hummus: Check out my recipe for hummus. Dave and I make almost a quart of hummus every week — rich in protein, Omega 3s, and depending on what you put in it (garlic, red peppers, cayenne..), it can be a great immune system booster! Enjoy celery, peppers, broccoli, or cucumber sliced up and dipped in hummus as your mid-afternoon snack! Gluten-free rice crackers or whole-grain seeded crackers are other dipping options if your body can tolerate. - Half Cup Unsweetened Apple Sauce with Pecans: For me, when it’s coming up to “that time of the month”, my pallet switches and I’m craving sweeter and sweeter foods. So this is my snack tip for those times you just need something sweet. However you do need to plan ahead and make this one at home at least a day ahead of time. I take 2 Granny Smith apples (diced) and a squeeze of lemon juice, perhaps a sprinkle of stevia if they are particularly sour apples, and add that all to a small pot with 1/3c water. Put a lid on and simmer until apples are soft. Mush up with a potato masher and put in my glass Pyrex container for the next morning. I top this yummy, fresh applesauce with cinnamon and raw pecans to put those sweets cravings to a halt! You can also do raw apple sauce by putting all the ingredients (less water) into your food processor and pureeing until smooth. Voila! Also great topped with a little Greek yogurt and unsweetened dried cranberries. - An Ounce or Two of Dark Chocolate: Organic (does this sound like a recording yet?) is always best, and be sure to stick to 70%+ intensity chocolate, meaning little to no sugar has been added. Chocolate at 70%+ is very rich in anti-oxidants. Every so often, a little bit of the right chocolate is a good thing! Great ideas for snacks! As far as chocolate goes, which is actually better for you? Carob, cocoa, or cacao? I can’t find any information about air poppedpopcorn. Is it okay on either of the Max living plans? It’s my favorite brand because it is non-GMO and (almost) certified organic (they’ll qualify in another year I think…you know the time lapse that has to pass). They do not treat their corn with any chemicals. I read in the cookbook Nourishing Traditions under Snacks & Finger Foods nuts are easier to digest and give more nutrients if they are soaked in salt water overnight, then dried in a warm oven or dehydrator. All her snacks with nuts are crispy. Do you think snacks are better for you this way? Even her Flourless Almond Cake recipe calls for crispy almonds processed into flour. Elise, what is your thoughts on this? Your recipes do not call for soaking and drying the almonds (other nuts) to make cakes and cookies, etc. Do you recommend a brand of hydrator? (My oven does not get below 170 degrees). Yes, whenever you can sprout your nuts and seeds they have more nutritional value than simply raw nuts. I personally don’t own a dehydrator (yet), but I have my eye on an Excalibur brand model.